The 13th-century church and monastery of Sant'Agostino, once a place of retirement and seclusion, is now open for visitors to view the amazing collections within. 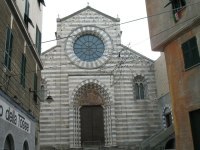 The church itself was built by the Augustinians in 1260, and is one of the few Gothic buildings remaining in Genoa. Today, the cloisters are a museum housing more than 4,000 works, including metal and stone sculptures, frescoes, and many architectural artefacts and fragments. One of the most popular attractions in Genoa, the museum is a must-see for visitors to the region. Although not large, the museum receives rave reviews from visitors. One of the only drawbacks is that, like many museums in Genoa, Sant'Agostino has very little information in English and those who don't speak Italian should try to bring some materials with them. The museum is gradually linking its artefacts to mobile phone guides in English and Italian but this project is in its infancy. Photography is allowed in the museum but only non-flash and only in certain sections; visitors may be required to fill out a form stating that they won't use the photographs taken for commercial purposes.